Vada's Blog Stamp Inks and Paper : Did Someone Say “Party Hats”? Gingersnaps Creative Connections Theme is Party Hats. So my card is just for fun. My stamp is from Arts Impressions and she is colored with Copic Markers and sprayed with Glimmer Mist. On acetate I printed my verse which is hard to read due to all the shine of the acetate and confetti party hats, but (“IRL”) it’s really easy to read. No Party Hats and Horns. Would love to see what you come up with, so won’t you join us? Looks like she may have already did the party scene! 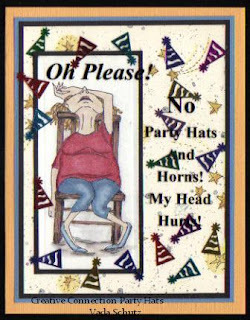 Love your party hat challenge piece and that image is priceless! Hope you had a wonderful Christmas and New Year's! Oh, so cute. This is my sentiments too. (You know this means we are getting old). This is such a fun card- love the cute lady image! hahahahahah too funny, I havent partied for New years in at least 10 years, what does that tell you??? teeheehee. This is such good fun but so true after the festive season ... poor thing.